Analysing the tap tones of an instrument is one of my most important tools as a guitar maker. A series of recorded taps will reveal a huge amount of information about an instrument, and as I develop as a builder I have a record of the characteristics of the ones I’ve already finished. This allows me to direct my efforts to make each one better than the last. Tap-tone analysis is something anyone with access to a small hammer and a computer can do, and even if you aren’t a builder it can give a really interesting insight into guitars and what you want from them. Excel spreadsheeting software if you want to make direct comparisons between instruments or taps on different parts of the same one. The first thing to do is to muffle the strings with a soft piece of cloth so they won’t ring. Set Audacity’s sampling rate to 32000Hz to get good detail without overloading the buffer. This is the record of the sound pulse produced by your tap series, and it contains a surprising amount of information once it can be unlocked. The key is a process called Fast Fourier Transform (FFT) that shows you all the frequencies present in the top response – in other words, how the instrument responded in detail to you tapping it. 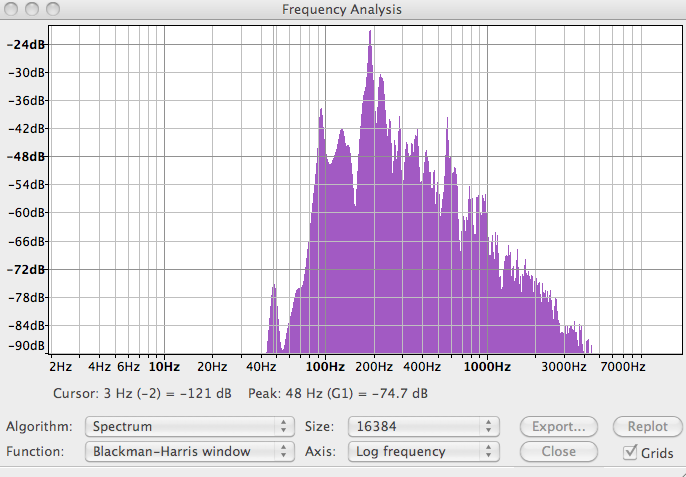 For comparison with mine, select the Blackman-Harris window, size 16384, and Log frequency as I have. And that’s the spectral signature of your guitar. It’s like a sonic fingerprint – notice that there are a series of peak responses right across the spectrum, each of which is produced by a different mode of vibration. Complex? Oh, yes! Note that there’s a peak at 50Hz. This has nothing to do with the guitar – it’s the 50 cycle hum that pervades a house where electrical appliances are at work. Given the nature of the dB scale, though, anything reading less than say -60dB is kind of suspect. Remember that the difference between -40dB and -60dB is a difference of 100 times the sound power. All guitars have a similar spectral response because that’s what makes them guitars (a guitar is a sound, not a wooden box). But as with fingerprints, each guitar is unique in detail. And unlike a person’s fingerprint, a spectral signature can tell you a great deal about the guitar that makes it. The format of the Audacity file makes it hard to compare taps directly. For that you need to export the data to Excel and plot a graph of it, but I’ll explain how to do that on another occasion. You can see the idea if you go to my blog entry on vibrating guitars. And the next question is: what does the signature mean? Ah, another time, another blog. One last comment, though. There’s no substitute for your own ear when you choose a guitar – what’s right is what you like.